BAKERSFIELD, Calif. — Kern County Sheriff's Office Search and Rescue officials said they are seeing an uptick in distressed hikers along a trail located in Lake Isabella's backyard and now it may become even harder for rescue crews to get hikers the support they need. Crews said if a new forest revision plan from the U.S. Forest Service is passed after the government re-opens and forest service operations resume, many current multi-use trails and access roads will be shut down making it harder to save lives in the wilderness. 23ABC News spoke with those tasked with helping hikers in need and gathered details on how this new plan came about and what it entails. According to Kern County Sheriff's Office Search and Rescue crew after the movie "Wild," was released in 2014 rescue officials have seen a spike in hikers taking to the Pacific Crest Trail (PCT) prompting more rescues as well. 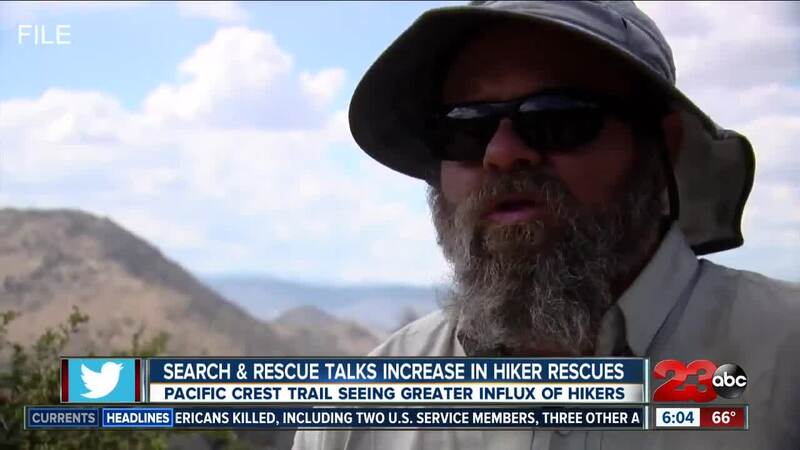 Brian Baskin a Search and Rescue volunteer for Kern Valley & The Kern County Sheriffs Department said,"We're seeing a marked increase in the amount of rescues that are occuring on the PCT trail. There has been a lot of media sensation around the PCT and a lot of movies that have increased the amount of people that want to participate on that trail." "It was focused on a girl that was troubled and one of her healing processes was to go on the PCT. It showed many of the struggles and some accurately and some inaccurately and it creates a false sense of security for those that may watch it and feel like they can go out and walk the PCT without a lot of preparation,"Baskin said. Both Baskin and hikers said one of the main factors leading to more rescues is also the lack of water available on the trail. "The Kern County section is one of the driest sections in the entire length of the trail and water sources are challenging to find which actually promotes a lot of the rescues," Baskin said. "People did it 40 years ago I just don't know how they did it. Water sources out there are really rare and a lot of the water that you do find is kind of scummy," A PCT hiker told 23ABC News back in May of 2018. Baskin said before the 2014 movie release there were no rescues on the PCT, but in 2016 there were five and in 2018 there was a total of ten rescues by the end of December. According to the Pacific Crest Trail Association website there was also a dramatic increase in the number permits issued each year since the movie was released. In 2013 there were 1,879 permits issued to PCT hikers and 7,313 permits issued in 2018, Baskin said his Kern County rescue crews are worried the new forest revision plan may impact their ability to rescue hikers. "The forest service is considering a change to the access using local roads that cross the PCT. We're very concerned that these closures would limit the trail angel ability to provide support and water thereby increasing rescues. It also would make rescues much more difficult. Currently we are able to drive up to many victims and pick them up and it's very straight forward and simple. With this closure it's going to increase millage and make rescues much more difficult. This will include a lot more resources it could include things like helicopters and long hikes to get people," Baskin said. "The Pacific Crest Trail Association is in support of a management corridor for the entire 2,650-mile trail as a way to get consistent management decisions from one forest to the next. Management of the lands adjacent to the trail is necessary to ensure the trail provides a scenic and remote experience. We are not advocating for any existing designated roads or trails to be closed. We do not support the construction of new roads in the PCT corridor unless the agency or county have no other reasonable alternatives and it truly provides for an overriding public need. As a way of protecting the trail and the landscapes, we believe new roads should not be built without meeting that high standard of due diligence." As of right now the U.S. Forest Service is closed down until the government reopens. They were also unable to comment for that reason. However, when operations resume we will see if the plan is approved and if any closures come with it.